“How Much I Feel” “Biggest Part of Me” and “You’re the Only Woman” were just a few of the hits of the five-time Grammy Award nominated progressive rock band Ambrosia. The man on the drums and founding member? He is percussionist, producer, songwriter and singer Burleigh Drummond. Ambrosia drummer Burleigh Drummond will be joining Halli at her table on The Halli Casser-Jayne Show, Wednesday, June 8, 3 pm ET for an in-depth interview. Formed in southern California in 1970 as a quartet, along with Burleigh, the groups members included guitarist/vocalist David Pack, bassist/vocalist Joe Puerta and keyboardist Christopher North. 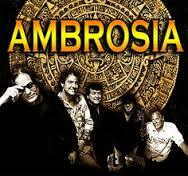 They chose the name Ambrosia to represent a vision of their music: all shades, textures, colors and styles. Ambrosia had five Top 40 hit singles on Warner Bros. Drummond is the only Ambrosia drummer/percussionist for the band, and with good reason. There is only one Burleigh Drummond. A self-described “Army brat,” Drummond’s parents were in the U.S. Army, with his father a full Colonel and his mother an army nurse. The family moved often and ended up being stationed in Ankara, Turkey where as a child Drummond had an experience he found transformative: he watched and listened as artisans hammered out a large copper plate, not unlike a cymbal, “spinning and hammering in sublime synchronicity.” He’s been drumming ever since. What becomes a musician? Life as a rock star? A man and his music when Ambrosia drummer Burleigh Drummond visits The Halli Casser-Jayne Show, Wednesday, June 8, 3 pm ET. For more information visit Halli Casser-Jayne dot com.